Along with video, digital signage is a very effective way to display your message to clients, the public, or members of staff. If setup correctly it can be used to send out your message 24 hours per day and is already an effective marketing technique used by many top brands. Digital signage is the displaying of content on a screen, usually an LCD screen. Used inside a retail outlet or shop, public spaces, train and bus stations, shopping centres, and events, they can be situated either indoors or outdoors (with special screens), wall or ceiling mounted. The content is usually a selection of video, digital images, and information that you want to portray which informs the customer about your products and services. Usually the screens are setup so that the video and images display continuously in a loop as soon as you switch it on. Although you can use a standard monitor, a regular TV set, or any screen to display your message, there are a number of dedicated digital signage screens and displays from companies such as Samsung digital signage and LG digital signage to name but two. Commercial display units are designed to withstand 24 hour usage and are less prone to develop faults when used continuously. Sizes range from 7 inch up to 100 inch depending on the needs of the client. In general a 10-32 inch display mounted on a wall or mounted on a counter is sufficient. Some digital signage hardware also includes a built in player that will run and play video and images on your screen. Some Digital signage screens have players built in and some need an additional piece of hardware. What content should you show? The most important part of your digital signage solution is the content showing to your audience which you want to engage and watch. Digital signage systems will be able to show both video and still images which you can load into the system and they will then play that content continuously in a loop. Our business videos make a great option for signage content as they can explain the nature of your business, the services you offer and the benefits of using your company. Our systems also allow you to easily add your own still images and video to keep the content bang up to date. Is digital signage suitable for my business? 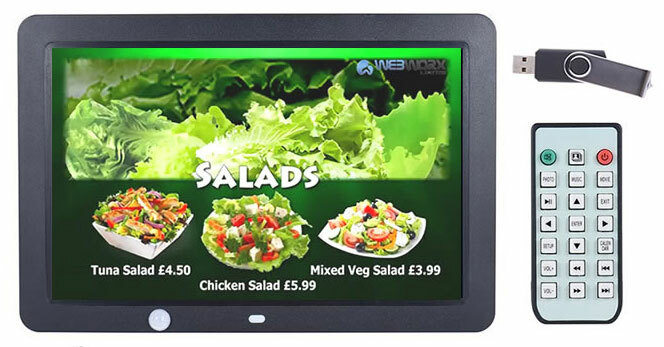 Digital signage suits a wide range of industries as it is so flexible. You can display simple text scrolling messages, still images, and full blown video. All you need is the space to put a screen (or screens) which can be from 10 inches upwards and can be fixed to a shelf displaying your promoted products, a wall, or by a customer waiting area. Point-of-purchase or point-of-sale merchandising displays. Engaging, colourful, and dynamic storefront and window displays to attract and draw in browsers, and passers-by converting to buyers. A digital signage screen can also be placed on your countertop or sales shelves to show your message or product explainers to customers. This will both advertise & promote your products/services, and keep consumers in your business for longer and spending more. Shops that can benefit include:- Newsagents, hairdressers, barbers, beauty/hair salons, coffee shops, restaurants and cafes, gift shops, hardware, tanning salons, mobile phone and computer stores, and many, many more! Showing special offers on memberships. Examples of workouts. Before and after for toned bodies. Examples of holistic treatments. Dynamic menus that update automatically from lunch to dinner Todays Specials and happy hours. Doctors Surgeries and Medical Orthopedics, Medical Centre, Chiropodists, and more can use our screens to promote services, educate, and make patients feel at ease. Lobby displays advertising hotel events and restaurant specials Tailored content to suit specific visitors for conference rooms and conventions. 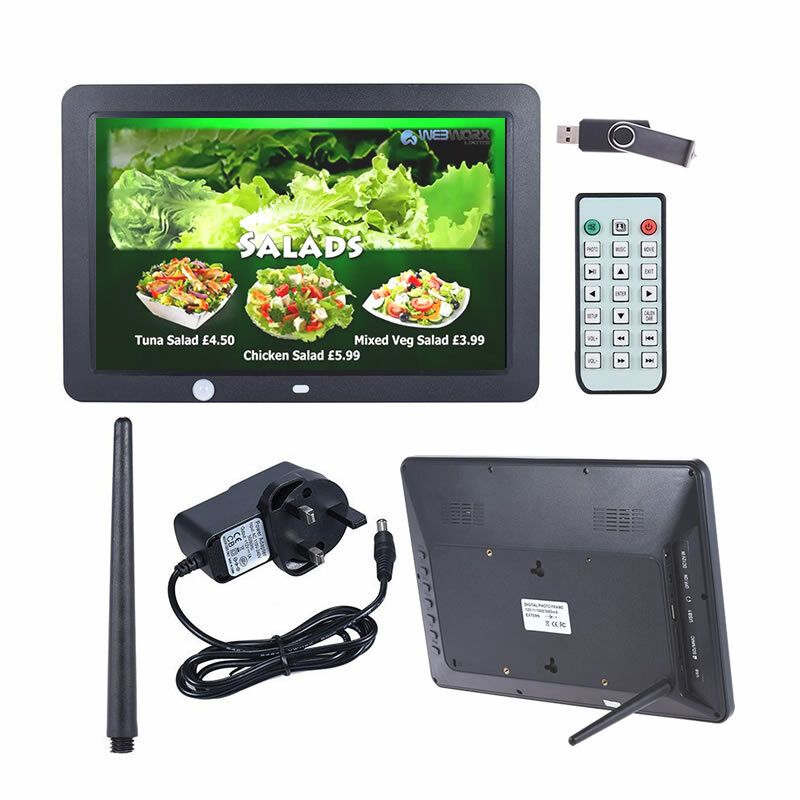 10″ or 12″ HD Screen with USB & SD Card Sockets, Volume, Brightness, power cable, mounting holes, and stand. *Longer and additional video’s available separately Not only can you play the digital signage video on your screen at your business, but you can also upload it to Social Media, Youtube, and your website! If you feel that a digital content system will benefit your company or need a video created then call on 07742 559833 or email info@webworxlimited.co.uk. We can advise you over the phone, and if you are in the local area of Essex (including Colchester, Maldon, Braintree, Harlow, southend, Basildon etc.) then we can happily pay you a personal visit to explain more. To arrange a meeting or for more details please call us today!